Proud Native Americans, brave explorers, ambitious prospectors, groundbreaking women: This week, Education World celebrates the history, spirit, and people of the American West in two new and very different books. A century after the era of the westward expansion came to an end, our culture is still filled with images of the American western frontier still permeate our culture. Unfortunately, much of what we believe about this period of America's past is more imagination than reality. Both of this week's Books in Education selections, although very different, show that the true tales of the Wild West are every bit as fascinating as the myths. 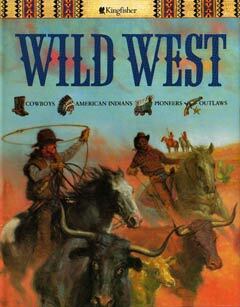 For an easy-to-read, highly engaging book for upper elementary school students, I recommend Mike Stotter's Wild West (Larousse Kingfisher Chambers Inc.), a richly illustrated exploration of the history of the western United States from the 17th century until the end of the 19th century. The book is organized into topical sections, starting with the early days of European exploration, followed by Native American life, ranch life and cowboys, the westward movement during the 19th century, forts and the military, outlaws and lawmen, and the railroad. "Early pioneers built their homes with whatever nature provided. Log cabins were built in the forests of the Northwest, but on the plains there were few trees, so cave-like homes were dug into the sides of hills. These tended to collapse, so the 'soddy' took their place. Once settlers could afford it, they built a more permanent structure." Stotter punctuates this information with sidebars describing the soddy (a house built of brick sod), the process for staking a land claim, and construction of doors and windows. In the same spread, he writes about the life of a pioneer family, with sidebars on the allocation of work, ways of keeping warm in winter, and the need for a nearby water source. Taken as a whole, each section provides a vivid picture of one aspect of the western frontier. 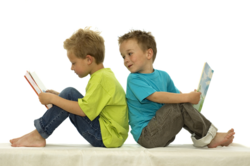 In the classroom, the individual spreads can provide the start of independent research projects; the students can be assigned different topics and augment the information presented in Wild West with other resource materials. Ten different artists provide colorful, detailed illustrations on every page. Several black-and-white photographs are scattered throughout the book, adding a sense of authenticity to the text. At the end of the book, Stotter provides a list of well-known people, a glossary, and an index. Although he lives in England, Mike Stotter is an aficionado of the American West. He is the author of several pulp Western novels and has contributed to reference works on the western frontier and western writers. For middle school and high school students, Judy Alter's Extraordinary Women of the American West (Children's Press) provides brief biographical profiles of more than 60 women who lived in or were associated with the American West from the 18th century through modern times. Included in these pages are cowgirls, explorers, politicians, reformers, artists, outlaws, and entertainers. From Sacajawea, the teenage Shoshone guide who accompanied Lewis and Clark on their 1804 expedition, to Edna Kahly Gladney, the Texas reformer who revolutionized adoption practices in the 1930's, Alter illustrates how the free, rough, hard-working spirit of the West produced women who were as tough, forward-thinking, and independent as the better-known, more widely chronicled men of that region. Alter profiles women from a variety of professions, including some politicians and political reformers. She highlights three women's rights activists, two governors, and four members of Congress. In 1869, Esther Morris, known as the "Mother of Woman's Suffrage," was largely responsible for women's gaining the right to vote in the territory of Wyoming -- the first of the territories or states to grant such a right. 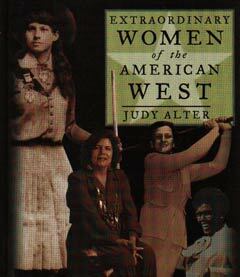 Alter also profiles Wilma Mankiller, chief of the Cherokee Nation in Oklahoma, in the chapter "And Into the Present. ..." Mankiller is both head of state and corporate chief executive officer, overseeing the second largest Native American tribe in the United States. Alter's book highlights not only politicians and political reformers but also numerous artists and writers. Alter tells of European-born sculptor Elisabet Ney, who moved to Texas in 1872 and scandalized her neighbors by keeping her maiden name, not wearing a wedding band, and dressing in either long, flowing, Grecian-style gowns or in white trousers with boots and a mannish-looking black coat. Artist Georgia O'Keefe, writers Willa Cather and Laura Ingalls Wilder, and ballerina Maria Tallchief are among others discussed in the book. Black-and-white photographs of the women, when available, illustrate the highlights of the women's lives. Alter provides a bibliography with select biographies, general reference books, and related Web sites. As an introduction to the lives of dozens of interesting women, Extraordinary Women of the American West is an interesting and useful resource. A Texas resident for more than 30 years, Judy Alter has written more than two dozen fiction and nonfiction books for children and adults. Many of her works deal with the West. From Sea to Shining Sea: A Nation Moves Westward! Turn Your Technology Center Into a Profit Center!